There is something very reassuring about a library. But I have to believe a lot of people don't know this particular one is here. You're absolutely right. The NHC library is part of the NOAA Miami Regional Library at AOML on Key Biscayne. Both branches are part of the NOAA Central Library in Silver Springs, Maryland. Generally, I work at the Miami Regional Library Mondays and Fridays (with Regional librarian, Linda Pikula and co-worker, Christie Wiley) and I'm the sole librarian at NHC Tuesday, Wednesday and Thursday. This library here has about 9,000 items catalogued. But again, we are part of the entire NOAA library system which has more than a million volumes catalogued. There are 28 libraries across the country in various NOAA labs and we are all interconnected through our on-line catalogue. I was very lucky. My background is in media production. So for quite a number of years I was in television production in one form or fashion. I was living in a beautiful part of southern Vermont. I was fortunate to be living somewhere I wanted, doing something I loved. But I decided for practical reasons to go back and further my education. It meant leaving the area. I had family in Florida, so I attended graduate school at the University of South Florida in Tampa. It was there that I discovered special libraries. Had you heard of them before? I didn't know they existed, but I thought that could be a real good fit for me because technology is combining with every field of study. I would think your media background would be very helpful. It has helped me a lot. I was looking into school libraries, because many times the school librarian is given the task of media production for the school. When I discovered special libraries, and all sorts of corporations and organizations can have them, I thought it would be a great opportunity to marry my interest in science with technology. I did an internship at the Arthur Vining Library of the MOTE Marine Laboratory with Sue Stover, who was a wonderful mentor. That pretty much sealed the deal. I finished my degree in Library and Information Science. Five years. It was my first job after graduate school. It is the only library I have ever worked in. I was very fortunate. A couple months after I graduated, this job came across my desk. It started as a three month position and 5 years later here I am. That seems very short! What was that about? I am not sure what it was. My first day on the job was Hurricane Charley (2004). The position just had a force of its own and I got swept up in it. Being from southern Vermont, I was not used to hurricane weather. I could not figure out how everyone was so calm when there was a hurricane coming! Who is the primary client in the library? That's a good question. We serve primarily NOAA staff from all divisions. But being a government library, we are accountable to academia, other government agencies, industry and the general public. So, if I am John Q. Public and I want to visit this library, is that an option for me? We were opened to the public with an appointment in advance. We still are, but security has tightened since 9-11. So now, you have to go through a security clearance. I would think this library would be very useful for graduate students? Yes, I get a lot of student reference questions. And because we are a nationwide organization, we are always helping researchers at other labs across the country. That includes interns and academics at different NOAA facilities. I notice that you have some folks in the library who are always there, and look like they are diligently cataloguing. Yes, there are two different projects going on. One is assisting (NHC Science Operations Officer) Dr. Chris Landsea with hurricane reanalysis. The library holds Monthly Weather Review back to the late 1800s, so they're using those and other reference materials. Another gal is assisting (NHC meteorologist) Colin McAdie with a storm wallet project. What is a storm wallet? A storm wallet is literally a folder referred to as a wallet that holds all materials related to a hurricane. It may include a preliminary report, newspaper clippings, recon data, satellite photos, etc. The data is being assembled in a specific fashion for each hurricane and shipped out to be digitized. It is quite an undertaking; they have been working on this for a couple of years. There are stacks upon stacks of materials back there. Are you taking it into the modern era? In order to be viable, you have to stay current with technology, and there has been a great thrust to go electronic. We've just recently eliminated some of our print journals in favor of the on-line versions. Most of our journals are on-line and we have hundreds of them. Digitization projects have become a greater focus. I just finished a project with the Miami weather forecast office here. With assistance from a WFO intern, we scanned more than 250 historical photographs in pdf format. Most of these are hurricane related photos and some are NWS staff. The objective is to get them on-line and made available to staff and the public. That's a good question. Like all of these projects, they are labor intensive. So we have to find funding to get them digitized. Certainly the library wants to obtain as much archival data as it can. Researchers are always looking to the past to take their research forward. So it is a matter of finding the funding and the technology to get them scanned in. In listening to you, it is very clear that you are really into this, that you enjoy your job. Yeah, I do. I like it more than I ever thought I would! I enjoy the people I work with and for. The NOAA librarians are a great group and I like serving in the science fields. Plus, my tasks are quite varied which makes it interesting. 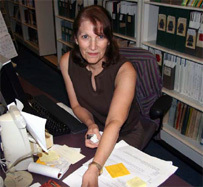 I do reference, cataloging, user education, literature searches, collection development and serial management. I ended up being my own webmaster and I am always working on special projects when needed. I think one of the first priorities will be to find funding to continue digitizing documents and to continue to make products available in other formats such as audio files and video streaming. I currently record audio for some of the science presentations and post them on the NHC library web site. It would be nice to see that project grow. Also, because of media background, I would like to develop a little media center at the library. I was able to acquire some used editing equipment and cameras. If we can get the funding to wire it together, perhaps we can do some video production, perhaps have streaming video. So, this is not your parents' library with the Dewey Decimal catalogue files? No it is not. We use Library of Congress call numbers. As more materials are digitized they now get added to the catalog record so you can go directly to the item online. This includes print resources and other formats such as video and audio files. We even have library resource training session on YouTube.